Dr Ronald Ernest (“Ron”) Paul, MD, is a graduate of Gettysburg College and Duke University School of Medicine. Between 1963 and 1968 he was a medical officer in the U.S. Air Force. From the 1960s until the 1980s he practised as an obstetrician-gynaecologist, and during those years delivered more than 4,000 babies. At a special election in April 1976 (which was held in order to fill a vacant seat), Paul was first elected to Congress. He narrowly lost at the regular election in November 1976, but regained the seat in November 1978. In 1984 he stood unsuccessfully for election to the Senate, and in 1985 he left the House of Representatives and returned to his obstetrics practice. He returned to Congress in 1997, and since then has been the U.S. Representative for Texas’s 14th district. He has announced that he will not stand for re-election in 2012. Dr Paul is also a three-time candidate for President (as a Libertarian in 1988 and as a Republican in 2008 and 2012). When his son, Rand, was elected to the Senate for Kentucky in 2010, Ron became the first U.S. Representative to sit concurrently with his son in the Senate. Since the early 1980s, Ron Paul has written many books, beginning with Gold, Peace and Prosperity (1981), The Case for Gold (1982) and Mises and Austrian Economics: A Personal View (1982, 2004), and also including Freedom Under Siege: The U.S. Constitution After 200 Years (1987), A Foreign Policy of Freedom: Peace, Commerce, and Honest Friendship (2007), Pillars of Prosperity: Free Markets, Honest Money and Private Property (2007), The Revolution: A Manifesto (2008), End The Fed (2009) and Liberty Defined: 50 Essential Issues That Affect Our Freedom (2011). See also The Ron Paul File at LewRockwell.com and the Congressman Ron Paul website. As an author and member of Congress, he has rigorously analysed and trenchantly criticised the U.S. Government’s fiscal, foreign and above all monetary policies. He knows and regrets what everybody else in Congress ignores or denies: the Fed’s virtually continuous – since its establishment in 1913 – policy of high inflation has underwritten Washington’s increasingly profligate fiscal and ever more aggressively interventionist foreign policy. The government’s policy [is creating] a short-term boom in housing. Like all artificially-created bubbles, the boom in housing prices cannot last forever. When housing prices fall, homeowners will experience difficulty as their equity is wiped out. Furthermore, the holders of the mortgage debt will also have a loss. These losses will be greater than they would have otherwise been had government policy not actively encouraged over-investment in housing. Perhaps the Federal Reserve can stave off the day of reckoning by purchasing GSE debt and pumping liquidity into the housing market, but this cannot hold off the inevitable drop in the housing market forever. In fact, postponing the necessary but painful market corrections will only deepen the inevitable fall. helps the GSEs attract investors who are willing to settle for lower yields than they would demand in the absence of the subsidy. Thus, the line of credit distorts the allocation of capital. More importantly, the line of credit is a promise on behalf of the government to engage in a huge unconstitutional and immoral income transfer from working Americans to holders of GSE debt. This is because the special privileges granted to Fannie and Freddie have distorted the housing market by allowing them to attract capital they could not attract under pure market conditions. As a result, capital is diverted from its most productive use into housing. This reduces the efficacy of the entire market and thus reduces the standard of living of all Americans. Despite the long-term damage to the economy inflicted by the government's interference in the housing market, the government's policy of diverting capital to other uses creates a short-term boom in housing. Like all artificially created bubbles, the boom in housing prices cannot last forever. When housing prices fall, homeowners will experience difficulty as their equity is wiped out. Furthermore, the holders of the mortgage debt will also have a loss. These losses will be greater than they would have otherwise been had government policy not actively encouraged over-investment in housing. “I hope today’s hearing sheds light on how special privileges granted to GSEs distort the housing market and endanger American taxpayers,” Paul concluded his testimony. “Congress should act to remove taxpayer support from the housing GSEs before the bubble bursts and taxpayers are once again forced to bail out investors who were misled by foolish government interference in the market.” For that reason, on that day he introduced the Free Housing Market Enhancement Act. This legislation would have removed government subsidies from Fannie Mae, Freddie Mac and the National Home Loan Bank Board. Alas, nobody co-sponsored the bill, and it stalled in the committee process. House prices have risen by nearly 25 per cent over the past two years. Although speculative activity has increased in some areas, at a national level these price increases largely reflect strong economic fundamentals, including robust growth in jobs and incomes, low mortgage rates, steady rates of household formation, and factors that limit the expansion of housing supply in some areas. House prices are unlikely to continue rising at current rates. However, as reflected in many private-sector forecasts such as the Blue Chip forecast mentioned earlier, a moderate cooling in the housing market, should one occur, would not be inconsistent with the economy continuing to grow at or near its potential next year. America’s economic difficulties, especially the problems in the housing market, are the direct result of the Federal Reserve’s inflationary policies … Inflationary monetary policies created the problems in the economy we are seeing, and these problems will be made worse, not better, by more inflation … Make no mistake, the problems faced by the American people are not caused by unscrupulous mortgage brokers or the rising price of oil. These are symptoms of an economic disease caused by a spendthrift Congress enabled by loose monetary policy. Rather than continuing to pursue a policy of easy credit and increasing debt, we need to return to a sound monetary system. Unless we embrace fundamental reforms, we will be caught in a financial storm that will humble this great country as no foreign enemy ever could. We can find safe harbour in our ideals. Reclaiming our historic legacy of principled commitment to liberty will, once again, unleash the innovative spirit that propelled our nation to the heights of prosperity. Why Don’t the Mainstream Media Treat Ron Paul Impartially? Fox News asked Paul: “What is it about you that the MSM fears?” He answered: “They don’t want to discuss my views, because I think they’re frightened by me challenging the status quo and the establishment.” Shortly thereafter, on CNN’s Piers Morgan Tonight, he elaborated: “They don’t want my views out there – they’re too dangerous … We want freedom, and we’re challenging the status quo. 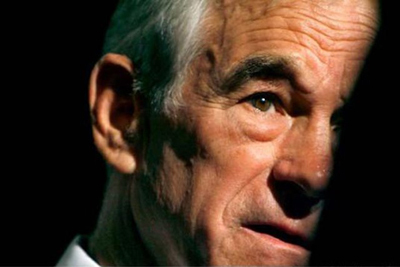 We want to end the war, we want a gold standard, and their view is that people just can’t handle all this freedom” (see Ron Paul: Media Are Frightened By Us, The Wall Street Journal, 16 August 2011 and Ron Paul: I Scare Mainstream Media, Newsmax, 17 August 2011). Does The Establishment fear liberty, or does it detest truth that speaks to power? A little context and history speak volumes. On 22 September 1964, during that year’s presidential election campaign, the Republicans’ nominee, Barry Goldwater, said that the U.S Government should do “whatever it took” to support U.S. troops in the (escalating) Vietnam war, and that if the administration of then-President Lyndon Johnson was not prepared to “take the war to North Vietnam,” then America’s military should withdraw. Although Goldwater discussed the possibility of using low-yield nuclear weapons in order to defoliate infiltration routes into and within Vietnam, he never explicitly advocated the use of nuclear weapons against the North Vietnamese. Nevertheless, the Democrats depicted Goldwater as a warmonger and an extremist who, if elected, would drop atomic bombs on Hanoi. Goldwater lost the election in a massive landslide. "Today, Ron Paul’s views are “threatening” and “extremist” partly because he is the only Republican candidate – indeed, the only presidential candidate of either party – who has categorically refused to use nuclear weapons – indeed, weapons of any description – against Iran." Newt Gingrich, too, is not just belligerent: he’s bloodthirsty. He advocates “regime change” by “whatever means necessary.” He demands increased sanctions and covert operations – that is, acts of war – to “break the Iranian regime” within a year by “cutting off the gasoline supply to Iran and then, frankly, sabotaging the only refinery they have.” He supports the use of “conventional military force” against Iran as a “last resort,” and struts and bellows like a Gauleiter: “Unless they disarm their entire system, we are going to replace their regime.” For a summary of these candidates’ positions, see in particular Tough Talk on Iran from GOP Candidates, The Los Angeles Times, 12 January 2012 – which, by the way, and characteristically, completely ignores Ron Paul! It’s important to emphasise that warmongering and imperial delusion are hardly a Republican affliction: they are a psychosis that, with a few honourable exceptions, pervades the Beltway, the American general public – indeed, the entire West (see Exploding the Myth of the Iranian Bomb, Public Takes Strong Stance Against Iran’s Nuclear Program and Some Caliphate). On 21 April 2008, the “progressive” Democrat Hilary Clinton pre-empted and outdid all of today’s neoconservative Republicans when she threatened to use nuclear weapons against Iran. In her warped mind, it presumably takes a nuclear detonation to remake a village to her satisfaction. In 1964, the mainstream denounced Goldwater as an extremist because (among other things) he wanted to intensify the war in Vietnam; in 2012, the mainstream dismisses and denounces Paul as an “extremist” partly because he refuses to attack Iran! The sad truth is that over the decades Paul hasn’t changed, but the American mainstream certainly has. Have Americans as a whole become so aggressive because their most prominent politicians are so bellicose? Or have American politicians merely given the public the wars they crave? Comedy Central’s Jon Stewart – whose thoughtful interviews shame the MSM – has also decried the MSM’s unbalanced coverage of Paul’s campaign. Stewart has presented a montage of MSM clips that shows commentators ignoring – and two CNN correspondents frankly admitting that they suppress – Paul (see also Stewart’s extended interview with Ron Paul). In The Economist (Manufacturing Irrelevance, 18 August 2011), Will Wilkinson wryly noted that if Paul had won the Iowa Straw Poll then the MSM would have dismissed the victory as irrelevant; but since Michelle Bachmann won – albeit by a razor-thin margin over Paul – they agreed that it boosted her campaign! The MSM’s approach seems to be: heads, the others win; tails, Paul loses. How’s that for impartiality? During the CBS/National Journal Debate in South Carolina on 12 November 2011, Paul was allocated a grand total of 90 seconds – 2.5% of the total – speaking time. His campaign responded: “Congressman Paul was only allocated 90 seconds of speaking in one televised hour. If we are to have an authentic national conversation on issues such as security and defence, we can and must do better to ensure that all voices are heard. CBS News, in their arrogance, may think they can choose the next president. 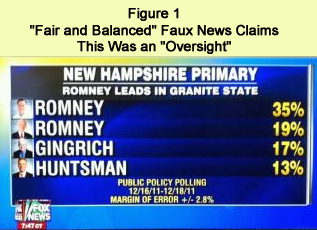 Fortunately, the people of Iowa, New Hampshire, and across America get to vote and not the media elites” (GOP Candidates Blast CBS News for ‘Disgraceful’ Bias at South Carolina Debate, ABC News, 12 November 2011). And on 3 January 2012, on the evening of the New Hampshire primary, CNN cut its live feed in mid-sentence during an interview with an American soldier supporting Ron Paul and his non-interventionist foreign policy. Was that another “technical” problem? On 17 August 2011, the Pew Research Center’s Project for Excellence in Journalism released research that confirmed that Paul has received quantitatively less and qualitatively more negative coverage from the MSM than have other candidates (see Are the Media Ignoring Ron Paul?). In October 2011, Pew released another study that reconfirmed that the MSM has accorded Paul disproportionately low and negative coverage. In nationwide surveys during the period the study covered, he polled 6.0-10.0% support, but received just 2% of media coverage – the lowest of all candidates. In late January 2012, The Atlantic cited the Pew study. It noted that despite steadily rising in the polls, Paul’s share of press coverage had shrunk. It also observed a sharp drop of positive coverage and a small rise of negative treatment (see Ron Hudson, The Ron Paul Media Blackout is Back On, The Atlantic, 26 January 2012). According to Paul Mulshine, The New York Times has effectively admitted that it has blacklisted Ron Paul (see The Times Admits It Deep-Sixed Ron Paul, The Star-Ledger, 16 January 2012 and News Narratives for 2012, The New York Times, 7 January 2012). Liberty, prudence, peace and strict adherence to the rule of law and the U.S. Constitution – apparently, these are not news that The Grey Lady sees fit to print. That most reporters faithfully follow the stenographer model – uncritically writing down what people say and then leaving it at that – is so obvious that it’s hardly worth the effort to demonstrate it. There are important exceptions to this practice … But by and large, most establishment news coverage consists of announcing that someone or other has made some claim, then (at most) adding that someone else has made a conflicting claim, and then walking away. This isn’t merely the practice of journalists; rather, it’s virtually their religion. They simply do not believe that reporting facts is what they should be doing. Recall David Gregory’s impassioned defence of the media’s behaviour in the lead-up to the Iraq War, when he rejected complaints that journalists failed to document falsehoods from Bush officials because “it’s not our role” and then sneered that only an ideologue would want them to do so (shortly thereafter, NBC named Gregory the new host of Meet the Press). Literally every day, one finds major news stories that consist of little more than the uncritical conveying of official claims, often protected by journalists not only from critical scrutiny but – thanks to the shield of anonymity they subserviently extend – from all forms of accountability. Every day one can find prominent news articles that are shaped entirely by the following template: A, B and C are true, say anonymous American officials; government claims drive the entire article and shape its narrative, with “officials say” tacked on as an afterthought, an unnoticed formality. In the realm of reporting on the government, this practice encourages and enables government lies; … it incentivises candidates to lie freely. But there is one important caveat that needs to be added here. This stenographic treatment by journalists is not available to everyone. Only those who wield power within America’s political and financial systems are entitled to receive this treatment. For everyone else – those who are viewed as ordinary, marginalised, or scorned by America’s political establishment – the exact opposite rules apply: their statements are subjected to extreme levels of scepticism in those rare instances when they’re heard at all. … This stenographic model is the primary means by which media outlets turn themselves into eager spokespeople and servants for the most powerful factions: the very opposite of the function they claim, with increasing absurdity, to perform. The test of fascism is not one’s rage against the Italian and German war lords. The test is how many of the essential principles of fascism do you accept and to what extent are you prepared to apply those fascist ideas to American social and economic life? When you can put your finger on the men or the groups that urge for America the debt-supported state, the state bent on the socialisation of investment and the bureaucratic government of industry and society, the establishment of the institution of militarism as the great glamorous public-works project of the nation and the institution of imperialism under which it proposes to regulate and rule the world and, along with this, proposes to alter the forms of our government to approach as closely as possible the unrestrained, absolute government. Then you will know you have located the authentic fascist. is not the danger of a breakdown of the currency and banking system, but the growing illiquidity of banks, insurance companies, saving institutions, etc. … Germany’s financial organisations are again in a situation where their assets which should be kept liquid have become “frozen” … But the totalitarian State can tighten its control over the whole financial system and appropriate for itself all private funds … [and] the institutions which still exist as private enterprises are not allowed to go bankrupt. For an artificial belief in credits and financial obligations has to be maintained in open conflict with realities. That’s an eerily accurate description of the EU’s trials and tribulations today. The Establishment in countries like Australia and Canada, of course, is every bit as bad – but its craven subservience makes it far more comical. As Mises and others have demonstrated, fascism and communism are peas in a pod. In “Bailout Marks Karl Marx’s Comeback” (The Financial Post, 20 September 2008), Martin Masse reminded us that the Communist Manifesto demanded the “centralisation of credit in the banks of the state, by means of a national bank with state capital and an exclusive monopoly.” Doesn’t Karl Marx’s demand now epitomise monetary policy throughout the West? In diametric contrast, Ron Paul advocates liberty, property, peace and sound money. He doesn’t lie, cheat, steal or kill. And that, frankly, is what’s “weird” about him. It’s startling – indeed, unnerving – to encounter an honest and consistent politician. It’s astounding that he doesn’t make profligate and idiotic promises that he cannot possibly keep; nor does he bribe electors with their own money. It’s astonishing to hear him utter the painful truth rather than a mishmash of babble, vague threats and blatant lies. It’s surreal that an intelligent, compassionate and honest man should speak truth to power – and possess a voting record that proves every word of it. “It isn’t that simple,” insists the mainstream. “It isn’t that simple” is what people say when they’re too stubborn to admit they’re wrong – or are profiting handsomely from a game that’s rigged massively to favour them. Whatever the mainstream’s stupid or loaded question, the answer is simple: property, liberty, peace and sound money. I’m sick of uninformed people with vested interests calling Dr Paul “weird.” He hasn’t destroyed the currency and the banking system, exploded America’s debt, gravely weakened its civil liberties, murdered tens of thousands and impoverished millions. His policies haven’t wrought this grievous damage; the mainstream’s have. The Establishment cannot abide the fact that he correctly warned about the stock market and housing bubbles, as well as the insane monetary policies that inflated them. To all of the dangers that Paul identified, the mainstream was as alert as Mister Magoo. Paul’s anti-statist warnings have been vindicated; for this reason, the statist mainstream ignores and smears him. He knows what it hysterically denies: although it enriches a privileged few insiders, interventionism always and inevitably impoverishes the mass of outsiders. If Ron Paul is “crazy” then America and the Western world as a whole desperately need more “crazy” people.